This pen was based upon an earlier design made by Eversharp, whose pen division Parker acquired in 1957, and was released in 1960 as the Parker 45 in honour of the famous western revolver guns and as a reference to the fact that it could be loaded with cartridges as well as a squeezey ink converter. As well as a new cartridge/converter filling system the 45 also had a new nib which could simply be unscrewed and replaced as required with a wide variety of nibs available. Aimed at the school pen market the new Parker 45 was simple to use and cheap to produce and became a great success, so much so that Parker realising that they were on to a winner began to produce more upmarket versions in metal known as Parker 45 Flighters which eventually led to a even more variations, colours and finishes. The 45 was eventually discontinued in 2007 after an amazing production run that saw a huge number of varieties and colours produced, but all using the same shell, nib and ink system fitting making parts almost totally interchangeable between pens. For the collector the most easily recognisable part is the small triangular half hooded nib, available in gold, gold plate and steel, which can be unscrewed as a unit with the collar and ink feeder. 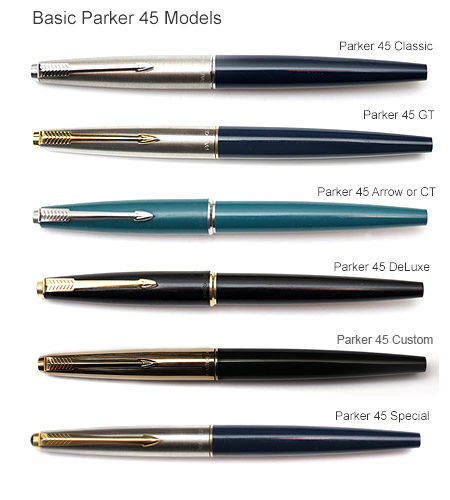 There are numerous Parker 45 copies, notably by Hero Pens (China) and Wilson Pens (India) so look for the "Parker" engraving on the cap and the ink converter as well as on the nib itself under the collar hood. 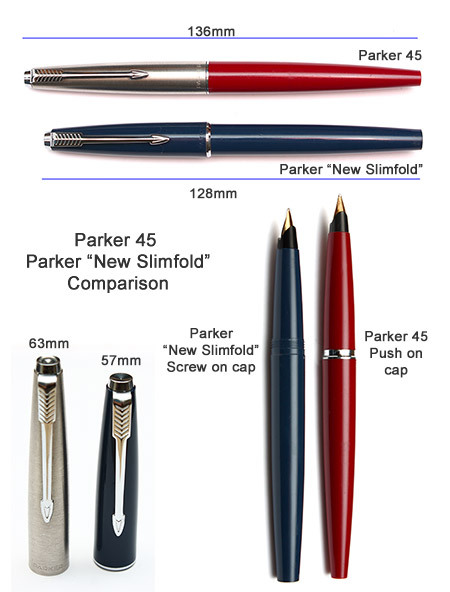 Also be aware that there was a Parker model known as the Parker "New Slimfold" which was very similar in appearance although it had a screw on cap unlike the push on cap of the Parker 45. See bottom of page for more details on the New Slimfold. 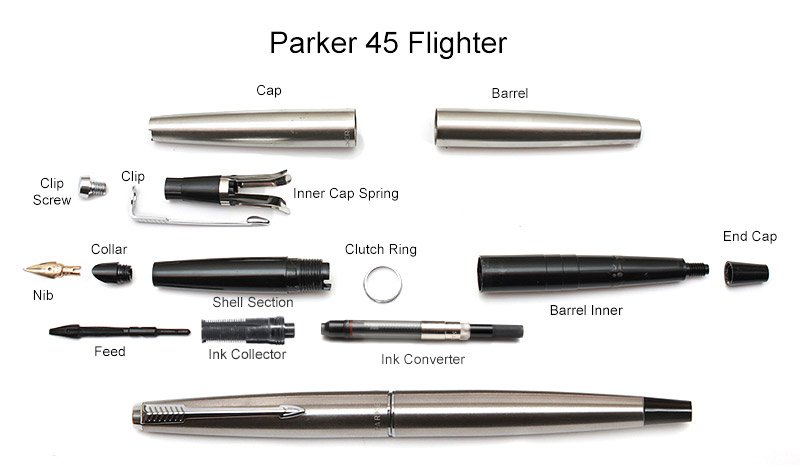 Parker 45 Classic - Plastic barrel and shell section, silver metal cap, silver arrow and clutch ring. 14K Gold nib. There was also the slightly later "Student" version in vibrant colours or "Happy Colours" fitted with a steel nib introduced in 1969. Parker 45 Arrow or CT (Chrome Trim) - Plastic barrel, shell section and cap, silver (chrome) trim. Introduced in 1962 as the Parker 45 "Arrow" which later became the Parker 45 CT. Some examples have had steel nibs, most seem to have 14k gold. Parker 45 Custom - Plastic barrel, shell section with a Rolled Gold "insignia" cap and clutch ring. 14K Gold nib. Rolled Gold would suggest early 1970's onwards but exact dates are unknown. 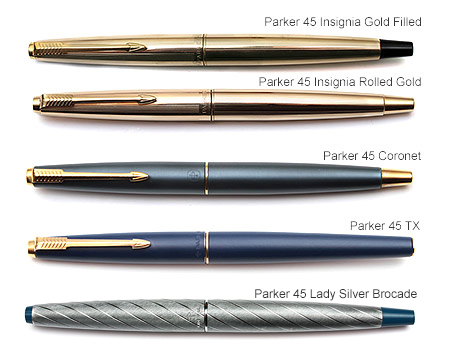 Parker 45 Special began in 2001 and featured the new redesigned arrow clip and the cabochon jewel clip screw in gold. The Parker 45 Flighter was introduced early on as a more up market metal bodied brushed steel alternative to the cheaper plastic pens and became a huge success in the 45 line up to the point where at the end of production the Flighter was the last of the 45s to be made. Early models had a silver arrow clip and a black plastic end cap although at some point in the early 1970s the black tip was changed to a silver metal tip. Rarer versions exist with coloured end caps and shell section to match, for example red. Gold trimmed "Flighter Deluxe" versions also became available with a gold clip and tip., Rarer versions exist with a coloured end cap and shell grip section to match the end cap but retain the gold trimmed arrow clip and clutch ring. Later versions, around the early 1980's, lost the end cap altogether becoming flattened off, available as both gold and silver trimmed. In 2001 the Parker 45 Flighter received its final make-over with a redesigned modern streamlined arrow clip and a black cabochon on the clip screw available only in gold trim. Finally in 2008 these last of the line pens were discontinued. 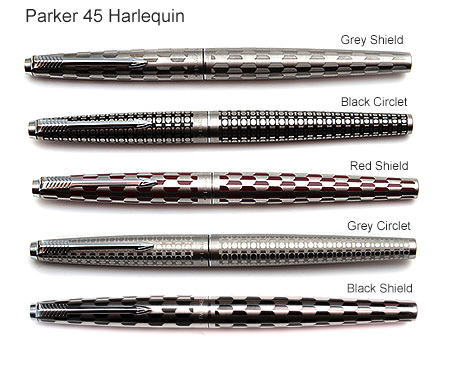 Amongst the most collectable of the Parker 45 family are the Harlequins which were produced for a short period of time in the late 70's to the early 80's and which feature a two tone pattern of either circlets or shields. The most common ones are in the unpainted Grey Shield or Grey Circlet with coloured ones being more rare and therefore more desirable for the collector. 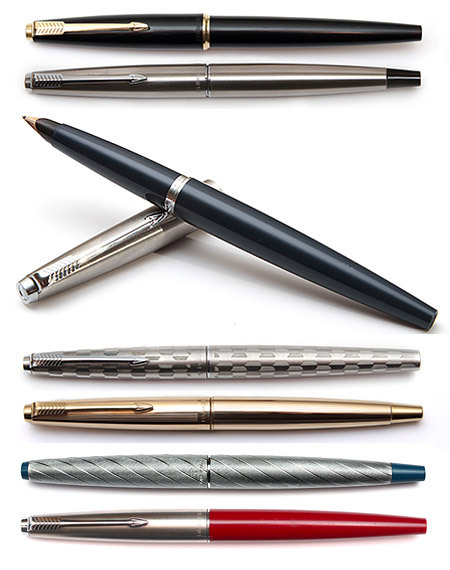 After a few years the pen was discontinued due to the higher production costs of producing them compared to the regular Flighter, as well as the difficulty involved in making them, particularly the coloured shield varieties. To this day some examples display obvious manufacturing faults such as areas where the colour is missing or where the etching has become misaligned. Other then the obvious patterns a Harlequin will typically have chrome trim, a steel nib and no end cap although there are some very rare examples which have a flat end cap tassie fitted which are probably prototypes. Standard colours are Grey and Black. Other colours were produced for example red/maroon but are very rare. Other members of the Parker 45 Family include the Parker 45 Insignia which was first introduced in 1965 as a Gold Filled body with a black plastic tip and gold trim. The cap should be engraved with GF to denote the Gold Filled body. The later version had the black end cap exchanged for a gold one and is now covered by Rolled Gold, which again should be engraved on the cap. There are later rolled gold versions with a flat end cap as well as Rolled Silver versions. The Parker 45 TX was produced between 1979 and 1983 in the UK and features a matt blue epoxy resin over brass body with a matching blue shell section, a flat end cap and gold nib and trim. Only made for a short period of time and falling sales across the market makes the TX quite a rare pen. Parker also made a clip less version called the Parker 45 Lady, introduced in 1967 and designed to be kept in a purse or handbag (hence the lack of a clip!). These were available in Silver or Gold "Brocade" pattern - a simple diagonal spiral pattern cut into the aluminum body. 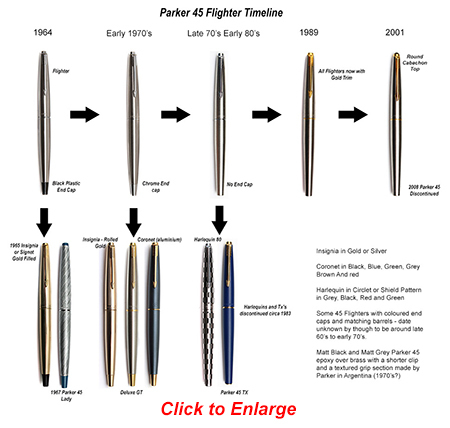 Parker 45 Compared With The Parker "New Slimfold"
Between late1971 and 1975 Parker produced a very similar pen to the Parker 45 which was marketed as the Parker "New Slimfold" which at first glance is almost identical to its more well known cousin. Both share the same nib, collar and feed, both use the same arrow clip and individually both look much the same.